The Lickey Hills Community Theatre’s March presentation – the second from this new group after its enormously successful launch last year featuring the Remy Harris Gypsy Jazz Project – demonstrates that variety thrives. The Lickey Trinity Centre audience were treated to a unique form of improvised comedy theatre in which Kevin Tomlinson, ably assisted by Abi Hood, effortlessly demonstrated how to think on your feet. A heady mix of sketches offered an off-kilter take on that emotion we call “love”! Excluding the obvious talent, one of the two principal devices used involves the audience who suggest lines from songs to be skillfully interwoven into storylines. 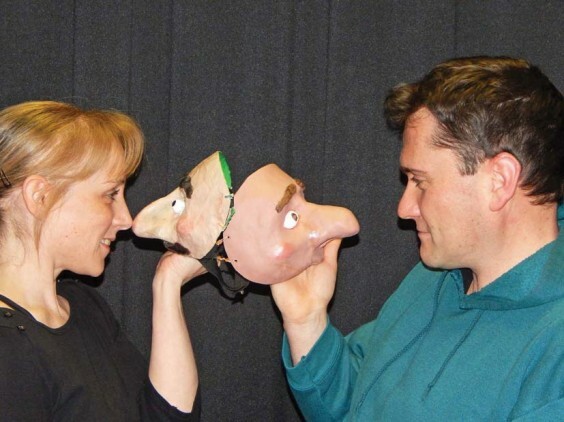 The other consisted of several wonderful masks that seemed to take over the actor – from a worried 10-year-old on Mother’s Day to a reminiscing, dressing-gowned 86-year-old in a care home, a final act that was both funny and moving. Other characters included a handcuffed vicar and nun on a CND march and a policewoman smitten with a prisoner giving birth to a coat. You really had to be there. Audience participation coincidentally included two local am-dram “celebrities”, Dave and Kay Morris, being invited on stage to reveal a little more of themselves than expected through clever guesswork from Kevin and Abi. The KEPOW Theatre Company, established almost 25 years ago, performs all over the UK – so if the occasion presents itself, don’t hesitate to grab a seat. Above: Abi Hood and Kevin Tomlinson.